Marly used one of my Tiki drawings ( see here ) and turned it into something that I hardly recognise. While my work looks like it is taken from some school magazine, this wallpaper design that Marly made could have been published in a glossy fashion magazine. I would never be able to do that myself. But it sure made my day when I found Marly’s work in my mailbox! She will try to find somebody who might be interested in actually producing such wallpaper. As soon as you can buy it, I will let you know. Marly has a great website, by the way: In-Space, where she shows what she does (interior designing!) and what she likes (interior designs!). Here is an exotic version of the Disney Tiki Room song. I found it on the Internet, but i have no idea who made it or even in what language it is sung. 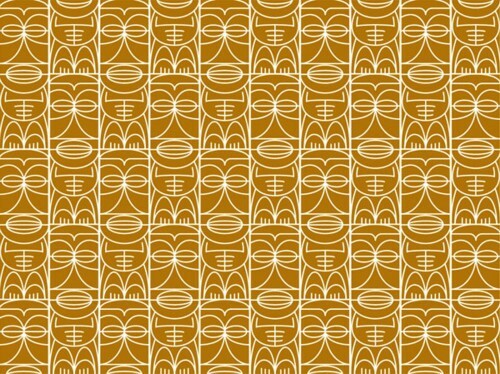 Hey there, we’re doing a piece for burning man and would love to use your tiki wallpaper for a backdrop. Can we have permission to use the image, or even better, grab a vector or larger file to use? Looking forward to hearing back.